Discussion in 'Cooking Forum' started by California Flyway, Jun 22, 2018. Celebrated a birthday, Fathers Day, and my buddies son graduating with a Masters in Enology. Forty pound Piglet roasted nicely at 275 over Oak, Madrone, Pecan, and Mesquite. Piglet roast went very well. Used 46 blocks to build roaster (note the blocks on the bottom turned to let air flow, one on each end). The cooker produced and held heat very well. 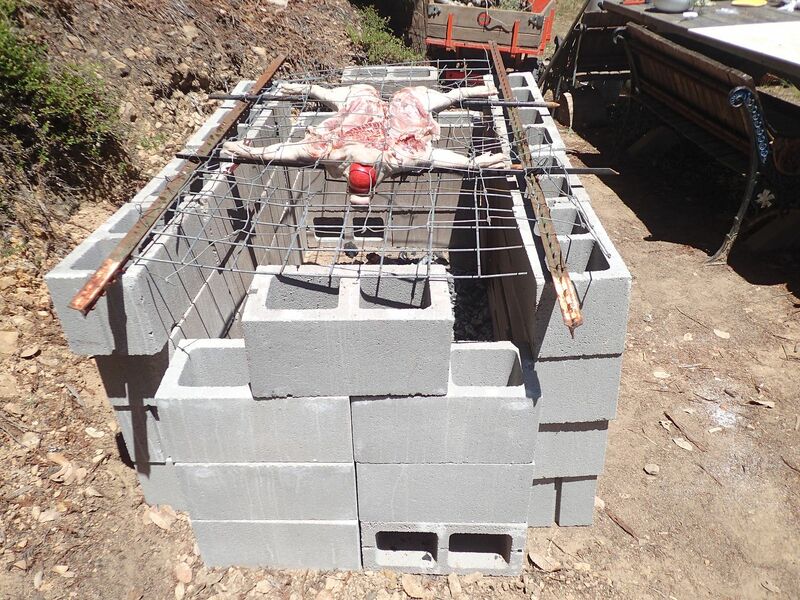 Two T posts and hog wire panels sandwiched supported piglet so it could be easily turned for basting and inspecting. I brined the piglet overnite with 3/4 cup of salt per gallon of water with some star anise thrown in. I injected the thicker meat sections with a mixture of apple juice, white vinegar, and a little brown sugar. I brushed the piglet with olive oil a number of times using a Rosemary mop. I used and highly recommend those remote temp sender probes to relay meat and fire temps. Took the meat to 180 then wrapped in foil and rested before carving. Served with my Wifes Chapotle dressing coleslaw and fresh baked Cherry pie. How do we survive up here on the North coast? I made up a light mustard sauce using a recipe Fuge member "Whistle" posted as a guideline. It worked very well as I did not want a heavy catsup type for a Piglet. I took these before pics but was too busy to take after. One of the kids took after but has not sent them to me. Meat came out great, very moist and tender. Folks dang near ate it all up. I grabbed some for sandwiches the next day. We drank a lot of good wine, mostly Syrah's from all over the State. The cooker was supposed to be temporary with the blocks to be used in my friends house construction. He like it so well it is staying in place as a party cooker. Shirleyshusband, callinfowl, Fowler267 and 2 others like this. Looks great! I did one pretty much like that a few years ago. Worked great! just like yours with cinderblocks. I was building a lawnmower shed at the time and had the redneck breakthrough idea of having a double gate made of chain link coated with aluminum. 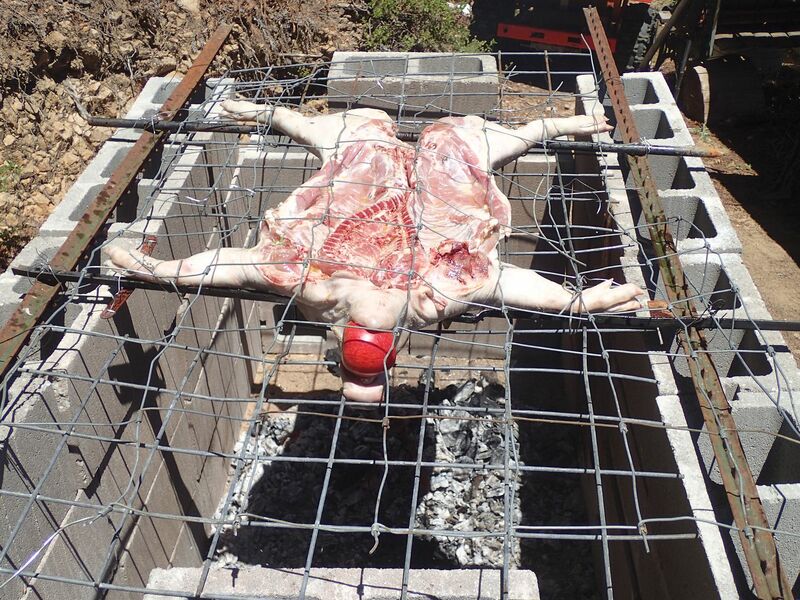 So when it's time to cook a pig, Just take off the gates, which were 3 ft x 4 ft, samich the pig in between them, then wire them together. Then the frame can be used to flipem. Then clean it off and Walla! it's a gate again. WHUP ! Hen, callinfowl and California Flyway like this. callinfowl and widgeon like this. Sault Ste. Marie, callinfowl, stevena198301 and 3 others like this. I think we should have a moment of silence. Winnie the pooh just lost his best friend. Sault Ste. Marie, callinfowl, num70 and 1 other person like this. Nice touch with the obligatory apple. Redneck cookin' is more better. No pictures of it cooked? Haha, you burnt it didn't you? TheDuckSlayer, JuvieCoot and 1911king like this. TheDuckSlayer and callinfowl like this.